Caring for our Earth doesn't have to be as difficult as it seems, and sometimes the little things go a long way. These one hundred percent biodegradable natural bamboo toothbrushes by F.E.T.E. * (which stands for From Earth To Earth) are perfect for giving you that winning smile, as well as looking after the world we live in. 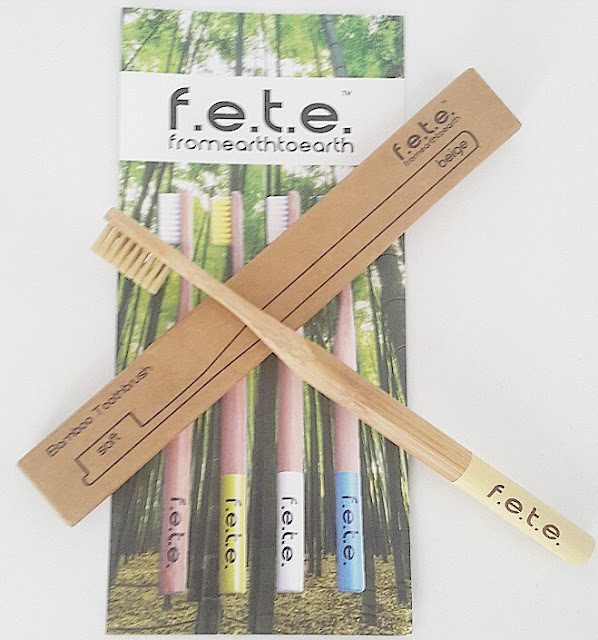 From Earth to Earth* are a small UK business that wants to revolutionalise our world, one toothbrush at a time. Their concept is to provide essential, practical products which are made from natural materials that come as directly from our Earth as possible; and when it's usefulness as passed, it can be returned to and benefit the Earth - a complete cycle of life. F.E.T.E. * toothbrushes are made from natural bamboo which is beneficial to the environment and to you, as the bamboo is also anti-microbial, anti-fungal and antibacterial meaning your toothbrush shouldn't become home to nasties. Not only is the handle going to help your health and that of our planet, but so are the bristles. They're made from one hundred percent biodegradable nylon, it leaves no waste as it goes straight back to where it came from! And, unlike most other bamboo toothbrushes, the packaging is one hundred percent biodefradable and recyclable too! I've been using this toothbrush now for a couple of weeks and I am in love with it. It's quickly become my favourite brand of toothbrush to use, and I know that's not something you hear every day but I think when you find a good toothbrush you stick to it. I love it and would highly recommend picking yourself one of these up. You can check out more on this brand and their toothbrushes by clicking here. I am clueless when it comes to toothbrushes, I have no loyalty to a brand and buy a different one every time I need a new one. This has really made me think harder about something which I use twice a day, thanks! I definitely need to start thinking more ethically about hygiene products! I already use Veeda's natural cotton and totally degradable sanitary towels but like Llinos, I hadn't really thought about the environmental impact of plastic toothbrushes! I'll definitely be looking into this company more! Ooh I'd never really thought about my toothbrush before if I'm honest! My fiancé would absolutely love this though, so I'll have to get us both one! I've never really looked into other toothbrushes, other than picking up whatever's on offer in supermarkets- but this one is so cute, and put a spanner in the works when it comes to buying ethically... may have to check it out soon! Interesting, I never really thought of the impact of buying plastic toothbrushes. I guess because they're an essential and I haven't seen any alternatives like this before now. Definitely something to consider when mine needs replacing!